Cork Coaching And Games have undertaken a programme of club visits over the past month in the form of Coaching Workshops for club coaches. These workshops cover the basic fundamental movement skills and fun games for children as well as some skill development models. Coaching Officers meetings have been held in Avondhu, Duhallow, Imokilly and Carbery/Beara, Carrigdhoun and Muskerry (next week). This programme provides a lead in to the Monster Blitz Programme that will run from March to October 2014 throughout the county. Two of the larger programmes are outlined below. Pat Spratt led the workshops as acting GDA for the North Region and the feedback has been very positive. Further visits are planned for the next 3 weeks so that all clubs in the North Region will have received a coaching workshop. Meanwhile in the Imokilly area, Sean Crowley GDA is currently visiting every club individually in the Division for Coaching meetings and workshops. The meetings/workshops are catered to meet the needs of each individual club and help the clubs evaluate the various programmes they have in place. Please see www.gaacork.ie for all the various programmes that Cork Coaching and Games will be rolling out through 2014 to help support clubs and schools in the county. 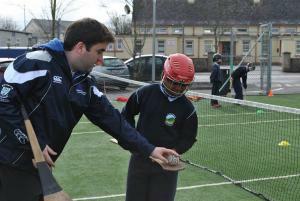 Cork Coaching and Games is part funded by Cork GAA Clubs Draw.